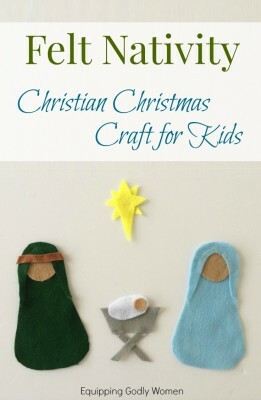 Looking for Christian Christmas crafts for kids that are beautiful, meaningful and easy to make? These Star of Bethlehem ornaments are just what you’re looking for! Guest post by Bren of Brendid.com. It may only be early December, but the holiday season is well underway! Neighborhoods are filling up with lights, blow up reindeer, abominable snowmen holding ornaments, and even Frozen snowmen. Yet, while these decorations are festive and cute, none immediately call to mind Jesus or the story of his birth. One classic symbol of Christian Christmas celebrations is the Star of Bethlehem or Christmas star. 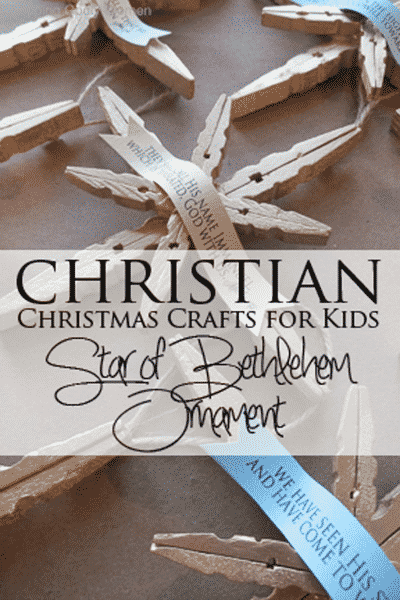 A fun way to introduce the Star of Bethlehem and the Christmas scriptures to your Christmas décor and to your children is with Christian Christmas crafts for kids. While you’ll have to do the hot glue yourself, your children will love spending time with you making this beautiful, easy and affordable Christmas clothespin craft. This tutorial will show you how. Not only are these Star of Bethlehem ornaments beautiful, but they also cost only about $0.30 each, making them an affordable craft project. All you need is clothes pins, glue, and paper. You can add paint or glitter if desired. 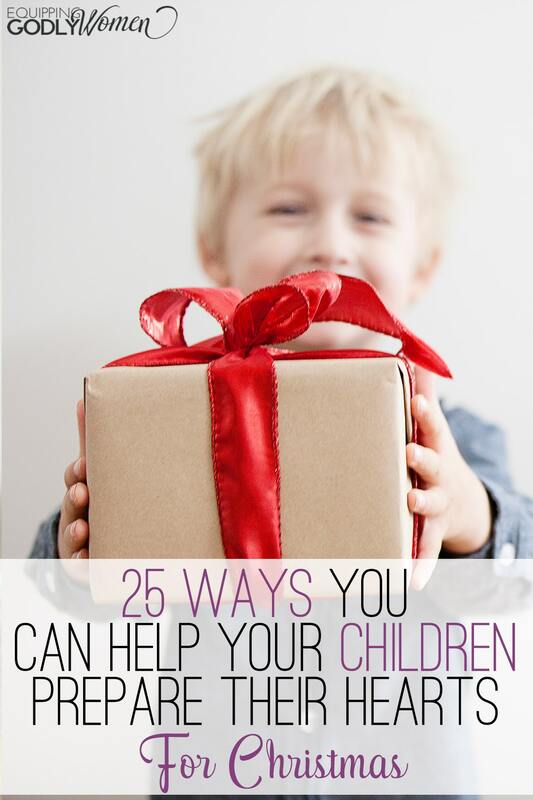 You may even already have all of the supplies on hand already, making these the perfect Christian Christmas crafts for kids! Don’t have small children? 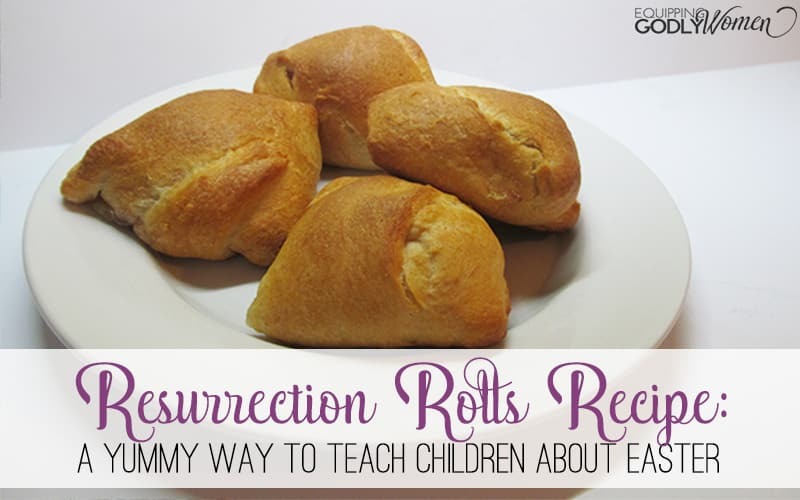 This would also be a fun activity to do with a Sunday school class or Bible study group as well. 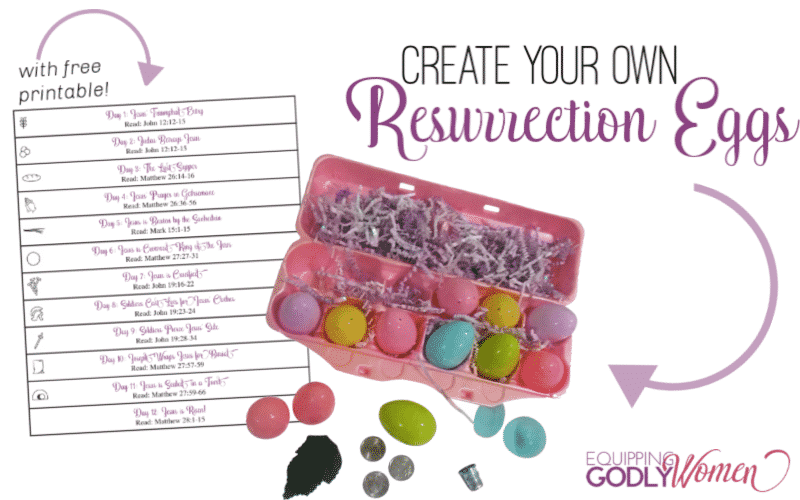 Participants can assemble the crafts while discussing the Scriptures. *This post contains affiliate links, which means if you make a purchase, I may make a small commission at no additional cost to you. 4 standard clothes pins and 4 mini clothes pins per ornament. The mini ornaments are about 1 ¾ inch long. Glue. I used a hot glue gun you can also use craft glue. It takes longer to dry, but is safer with small children. 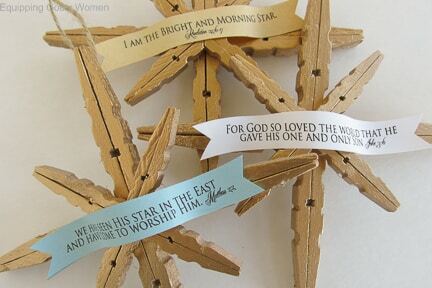 Pre-made printable Scripture tags, if you’d rather print them. Twine, string or ribbon for hanging. Optional: Gold acrylic paint or spray paint and/or glitter. Making these Christian Christmas crafts for kids is easy! Just follow the instructions below! 1. Remove the springs from your clothes pins. 2. 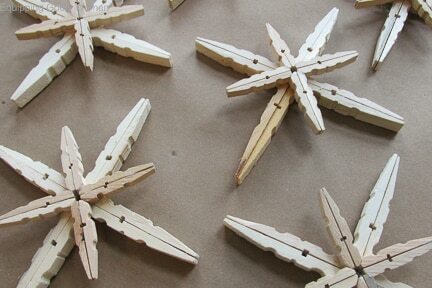 Glue 2 clothes pin pieces back to back to make rays for the stars. Continue until all clothes pins are made into rays. 3. Glue 4 large rays together at 90 degree angles to make the base of the star. Continue until all large clothespins are made into bases. 4. 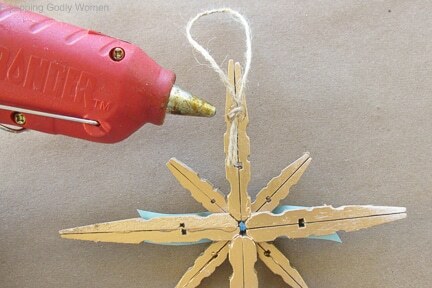 Glue 4 mini rays together at 90 degree angles to make the top layer of the star. 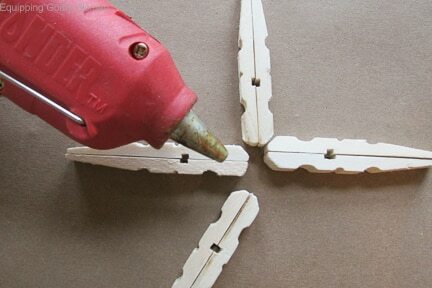 Continue until all mini clothespins are made into top layers. 5. Glue the top of each star to the base making sure the rays are off set (do not line up directly). 6. Paint and/or glitter your stars. Get creative! I used gold spray paint on mine. If you want to add glitter, apply an even coat of school glue and sprinkle with glitter. The stars would be cute in many colors. Let dry. 7. 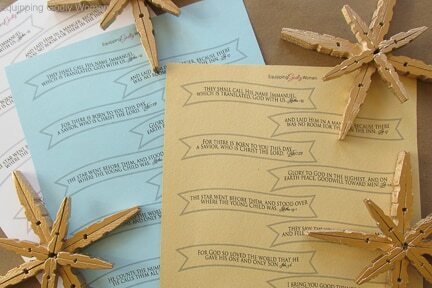 While the clothespins are drying, start preparing the Scripture verses to go on top. You have two choices here: If you have certain verses you’d like to use, a certain translation you prefer, or you’re really good at calligraphy, you’re welcome to write yours all out by hand. OR, if you don’t have the time for all that, you’re more than welcome to help yourself to the set I’ve already created. Simply enter your name and email in the box above and I’ll send them straight to your inbox! This way you can easily print as many as you need, and you’ll always have them on hand if you want to make even more next year. Note: Due to space constraints, these are not the full scriptures, but shortened versions that call to mind the entire reading. 8. Next, bend your Scripture banners slightly by pulling them over a pen or marker (the motion you use while curling ribbon). I like the ends to curl outward. 9. 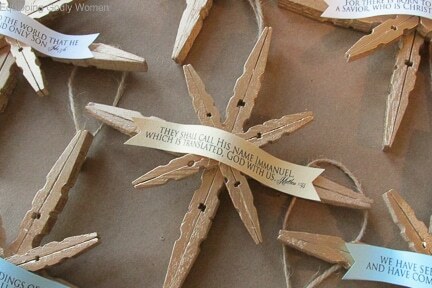 Glue the scriptures to the front of the star ornaments using a dab of hot glue or school glue and let dry. 10. Add a loop of ribbon, string or twine to hang the ornament. I used twine attached with hot glue. 11. Hang your ornaments and enjoy! These ornaments look great on the tree, as gift package tie-ons, or even hanging from windows. 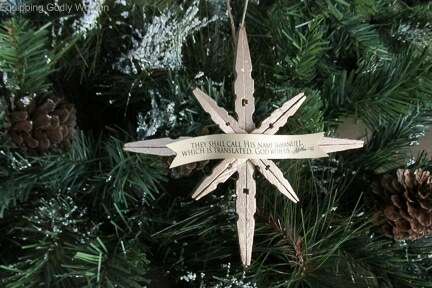 I hope you try making a few and add the Star of Bethlehem to your Christmas! 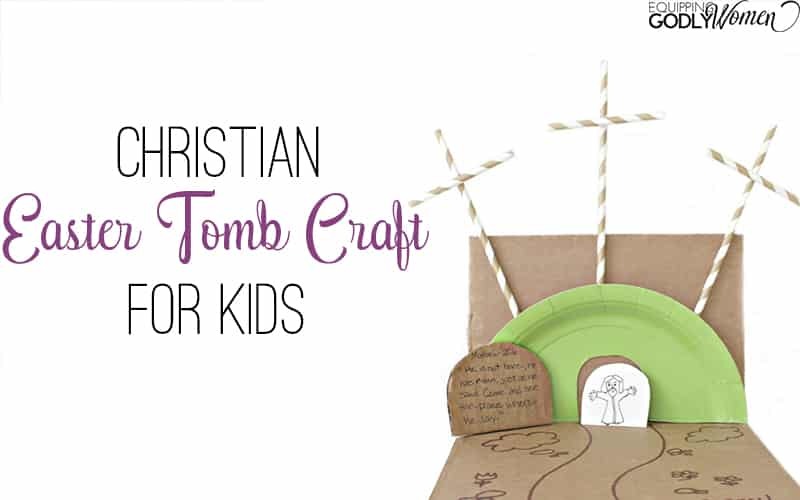 Looking for more Christian Christmas Crafts for kids? 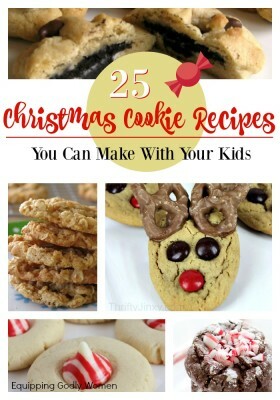 Are you planning on making any Christian Christmas crafts for kids this Christmas? What will you make? 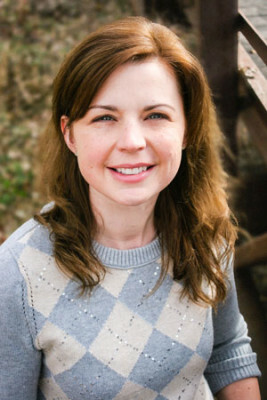 Bren is a creative SAHM mom, Navy wife, blogger and part time college instructor. She loves connecting with her family through crafts and cooking. 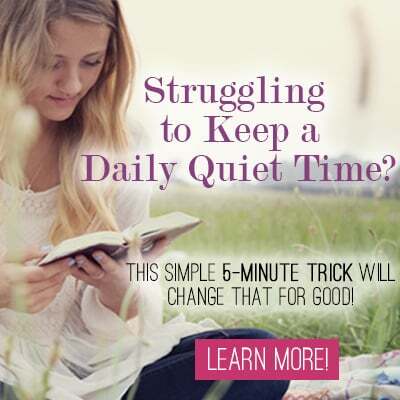 If you enjoyed this post and would like to see more like it head over to BrenDid.com where she shares more easy crafts, delicious recipes, DIY projects and natural home care tips. You can also find Bren on Facebook, Twitter and Pinterest. You’re making me blush! Thanks for all the love! I agree, Chris, they would be a great group project. These really are the most ingenious craft I have seen in a while! I LOVE this idea. I am telling everyone about this! Beautiful work! Erica, you have put such a big smile on my face! Thank you for your lovely compliment. Oh no! I’m so sorry you’ve had so much trouble! So, you can view the file on your computer, but it just won’t print? Can you print it straight from the link without downloading it first? So glad you got it to print!! Thanks for keeping me updated and sharing the tip! Are these made with special clothespins? If so, where can you find them? Thank You for sharing. 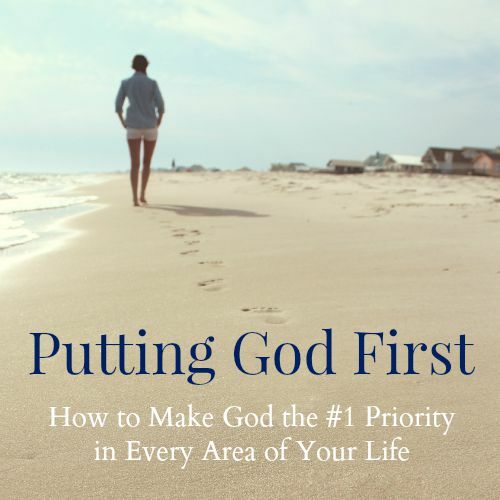 I usually teach 1-6th grade Sunday School (I have taken a year off to work on some health issues). This would be a great project for next year. Fun! I used to teach Sunday School too–it was great. Don’t forget to save this craft somewhere for easy reference til then! I enjoy following you and reading your blog! Praying for your continued success! Hi, Viva. I’m pretty sure that kind will work, but I double checked with Bren and replaced the link with the type she recommended just to be sure. Thanks! I absolutely love this craft! Thank you so much for sharing it! I had a little difficulty finding the correct size of mini clothespins, though. In the post the size of the mini clothespins is listed at being about 3/4 inch long, so I ordered 1 inch long clothespins. They were way too small! I ended up sending them back and ordering the ones posted in the link, but they are 1 3/4 inch, not 3/4 inch. You might want to edit the instructions. I’d hate for anyone else to make the same mistake I did. Will do–thanks! And sorry for all the trouble! That’s not good. I’ll email you the file here in a second and see if that helps. Weird. I’ll email you the file and see if that works. I emailed you, but it didn’t go through. Can you email me at [email protected] please? Can you email the file to me too? Would you be able to send me the link for the print out as well? This is such an awesome craft! 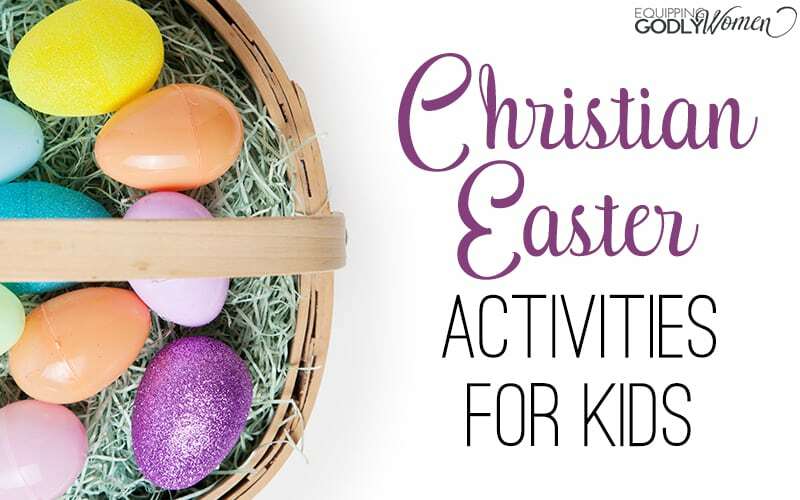 Looking forward to making it with our school kids for our older church members. Thanks! sent! Please let me know if you have any more troubles! I’m sorry you are having difficulties. I believe it was working, but something broke recently. I have since updated the post. 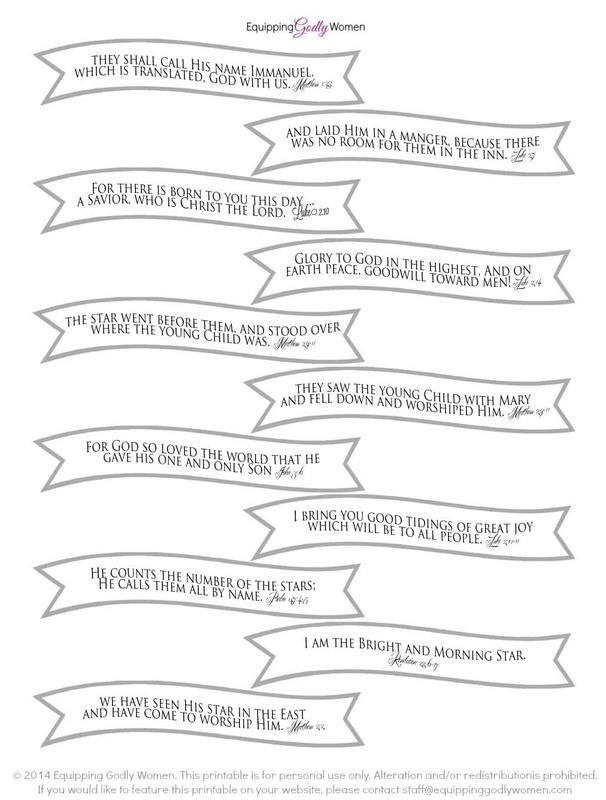 You can print the printable here: Star of Bethlehem Ornament Printable Hope that helps! I just came across these ornaments. They are amazing!!! I am having trouble printing the banners…I’ve tried both links 🙁 I can see from past this has been a problem….can you email me the file? Thank you in advance. Sent you an email! Please let me know if you didn’t get it! Awwww, that’s so sweet of you! Did it take forever? lol! Hi! My youth group is making these for a fundraiser they are doing for their mission trip. I noticed the scripture ribbons are copyright. Will we need special permission to use these if we are collecting money for them? Hi, Annie. Thanks for asking. Usually I would not allow designs to be resold, but since it is for a mission trip fundraiser, you may. Please do not resell them beyond this however. Thanks! Thank you so much Brittany! We appreciate it!